Like most others, I have had the good fortune to be alive and paying attention enough over the last ten years to bear witness to at least two major revolutions. I never thought I would see the day when people could actually talk to other people with their wrist watch, and just last month the Supreme Court reaffirmed its’ commitment to the equal protection clause of the Fourteenth Amendment by safeguarding equal access to the institution of marriage. These are major changes – both of which were propelled by and, in turn, will have major implications for democracy. Though not as long-in-the-making nor as groundbreaking, I’ve been watching the growing “Opt-Out” movement with a muted – but similar – enjoyment. Is the Opt-Out Movement Truly a Movement? For so long, parents have sent their children to school without asking many critical questions about what their children experience during the school day, including the decisions that administrators make about curriculum, or how data about their children’s performance on standardized tests are collected and used. Regardless, disgruntlement is minor and scattered. Parents experience and deal with these conflicts in vacuum, and the conflicts experienced by many individuals separated by space and time could never be regarded as a movement. So, the recent uproar about the over use of standardized tests, and calls for opting children out of said tests, in contrast, seems to be something of a revolution in the way that parents understand their role in their children’s education. No Child Left Behind (NCLB) stipulated in 2002 that all children grades 3-8 & 10th or 11th be tested using a state-administered standardized test. The intent then was to reach “universal proficiency” on those standardized tests by 2014. So, all students in every state had to “pass” these standardized tests by 2014. This was an extraordinary lofty (read: unrealistic), but worthwhile goal. Getting to “universal proficiency” by 2014, therefore, conveyed the expectation that states could close the achievement gap in 12 years. All schools had to show “adequate yearly progress” or “AYP” toward this goal of universal proficiency. If they didn’t, all sorts of penalties ensued. 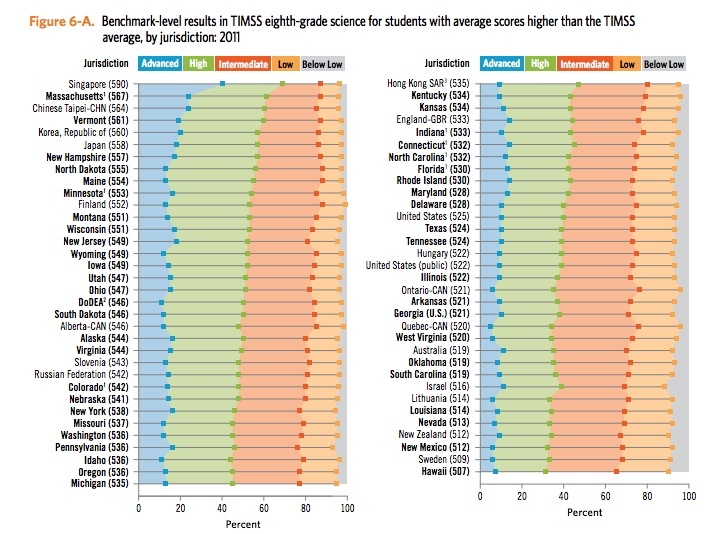 NCLB required standardized tests as the preferred way to track changes in student performance. As lofty as this goal was, when the data from these tests were crunched it became clear that NCLB and standardized tests weren’t closing the achievement gap. So, since the tests were to blame, a few powerful organizations set new guidelines about what American kids should be learning, resulting in the Common Core State Standards or CCSS. With little time to vet the standards, states adopted CCSS and implemented them in their schools. Then, some very lucky private companies were contracted and got a whole lot of money to design new tests to measure whether students were mastering CCSS. Two tests, the PARCC test and the Smarter-Balanced or “SBAC” test were adopted by most states. This year, our nation’s schoolchildren in grades 3-8 and 10th or 11th had the sad misfortune of “piloting” these new PARCC or SBAC tests while simultaneously phasing out their state’s old standardized tests. The result was dozens of school days (out of a 180-day school year) spent penciling in bubbles on Scantron sheets and/or clicking through items on the computer. Add together the state standardized tests; the new, and considerably more challenging, SBAC or PARCC test; for most 10th or 11th grade students their AP test and PSAT or SAT test; and, perhaps their ACT or other college-entrance tests and it’s pretty clear that this year we tested the hell out of American schoolchildren. This year, the number of parents who said “Thanks, but no thanks” (or more accurately, “Take your test and shove it!”) to standardized tests exploded. 155,000 kids opted out of tests in New York alone. As an education researcher, I lament the lost data. As a parent, I totally get it. On the one hand, I know our nation’s children are over-tested. According to education expert, Linda Darling Hammond, we as a nation focus more on testing than any other country in the world. We have too many standardized assessments. Some of them generate meaningful data, but others not so much. On the other hand, I know standardized tests are a source of information about student academic performance. Schools can use this data, but it’s typically used most by education researchers and the national government to help track (some would say exacerbate) the gap in performance between different segments of the American population. This summer is really the first time that I have thought about it on a personal level, because this school year my oldest daughter is entering third-grade. That is to say, this school year marks the first time NCLB and yearly testing is a reality for me as a parent. I also live in New Hampshire where our state’s new “parent trigger law“ allows parents to opt-out of any public school curriculum they deem inappropriate. Though our governor vetoed a bill that would allow parents to opt-out of standardized tests specifically, many of our state’s districts are allowing it. It’s probably only a matter of time before NH’s House and Senate override her veto, so I expect the Opt-Out debate to surface again in NH by winter. My husband and I take parenting decisions on a case-by-case basis. If I had a child who experienced tremendous anxiety over tests no matter how valiant our efforts were to calm her, I would probably pull her out. In that case, the tests would do more harm than good. I defend parents’ rights to protect their children in these cases. I also happen to think there is a massive level of hysteria around parents opting their children out of testing right now. I don’t judge them, they have their reasons.Their children might react more strongly to taking a test too, where my child doesn’t seem to register a difference between taking a standardized test and taking the teacher’s weekly spelling challenge. Yet, the hysteria overshadows the advantage of standardized testing, which is their power as a source of information and a diagnostic tool about how their child is learning. Finally, I hope that the parent veto rights bill isn’t overused in New Hampshire. I have many misgivings about parents telling schools regularly what should be in the curriculum. Parent vetoes convey a certain level of distrust in our teachers and schools and they are often used to prevent teachers from teaching things that are widely accepted by scientists to be true (e.g. evolution and climate change). For all of those reasons, we will have both of our children follow the standardized testing schedule in our district for now. Even having thought through all of this and made a decision (for this year at least), I will do several things to parent my kids through standardized tests. First, and most importantly, I will make sure my daughter understand these tests are not high stakes for her and don’t measure her intelligence. Standardized tests are not tests of intelligence, and just to be clear, intelligence tests (IQ) aren’t even tests of fixed intelligence. Any standardized test should be treated as a diagnostic tool at most, which can help us identify areas where we can support children’s learning more, and areas where they are already demonstrating mastery of skills and content. So, I’ll try not incite further hysteria in my child when I talk to her about the tests. I hope her teachers and building principals do the same – as far as I can tell they do. I will definitely be examining the testing results when they are returned, and in this manner the personal and the professional overlap for me since I have the training to make sense of test reports (which don’t make sense to many parents). This information can be useful to parents, teachers and schools, but test makers need to do more in the way of making test results meaningful for all. I also plan to be very active in the school district to make sure that the standardized testing results are NOT used in a high stakes or inappropriate manner. Standardized test results have been used inappropriately in New Hampshire’s recent past as a result of NCLB, and continue to be used inappropriately in other states now (e.g. as a punitive measure for districts failing to meet AYP or as a measure of teaching quality – both so wrong). NH has a waiver from NCLB so these misuses are unacceptable. In short, my children will take the tests for now, because standardized tests are a useful tool when used appropriately, they are no-stakes for my children in New Hampshire, and I can parent my kids through the experience. But, I have the option to change my mind and opt-out, and therein lies the sentiment that makes me a true geek for democracy and overjoys the social studies teacher still very much alive inside of me. The Opt-Out movement is a movement, and as such has the power to get more parents involved in very important day-to-day educational decisions. It also has the added benefit of bringing the “public” back into “public education,” because people more so than ever before in recent history, seem to be paying attention to what’s going on in our nation’s schools. So when the frenzy kicks back in again in the upcoming school year and people are debating who is opting in, who is opting out and who doesn’t really care one way or another… know there is at least one person in the nation who’s happy simply that people are recognizing there’s an “opt” in the discussion. The children are watching and learning that civic participation in our nation’s schools is a democratic and meaningful act. In a recent post, “Where are the good schools?” I joked that you can tell a lot about the quality of a school by noting “parent lingering” at pick up and drop-off, but did you know that schools often gather data on the amount of parent volunteerism in their district? This is for the simple reason that parent engagement is linked to student achievement. So, the number of hours logged by parent volunteers can quickly become a bragging right. These findings are hard to dismiss, and many state governments, national agencies and foundations are working to improve parent engagement in schools. Meanwhile, studies exploring the relationship between parent engagement and student achievement are gaining prominence. Take, for example, this study that points to specific behaviors of parents (“monitoring, warmth, and autonomy support”) as assets in preparing adolescents for career and college. Being an “involved” parent can mean many different things, and I know what you’re probably thinking: How can I find any more time to do that? You might also worry that you don’t have much to offer a classroom full of ten-year-olds. Trust me, volunteering in schools doesn’t have to be an on-going major commitment to reap the benefits. In fact, things you’re probably already doing – like staying on top of all of the paperwork that comes home from your children’s teachers, or consistently monitoring your child’s homework habits – both constitute very important types of parental engagement. In other words, simply showing an interest in what they do during the school day, from kindergarten through high school, leads to gains in achievement. Knowing details about what goes on during your child’s school day, and learning some of the “language of the school” leads to higher quality questions and conversations during the school year. With a quick skim of a teacher’s communications home, you can replace your standard questioning attempt, “How was your day?” with a better developed question that will lead to more information from your child like, “I read that you’re learning about compound words. I thought of one… ICE-CREAM! Is that a compound word?” Better yet, provide an incorrect example and see if your child can correct you and explain why you’re wrong – that will really get the gears going! Similar to giving your children good, high quality feedback on what they do well and what they need work on – as I addressed in this post – knowing details about what your kids are doing in school lead to higher quality conversation and point to clear avenues for you to engage in your children’s education. You’re creating a situation where you’re helping your kids practice their skills, you’re showing them your intellectual curiosity, and you’re subtly letting them know that you actually communicate with your kid’s teacher! It’s clear how all of this effort leads to the type of academic improvement we typically see with the children of engaged parents. So perhaps you don’t want to download and read EduTopia’s full guide for parents on engaging in schools, and maybe you don’t want to sign up with the PTA or PTG for something that requires your attention once a week for the whole school year. Rest assured knowing if this type of thing is the best you can do then you’re already doing pretty well. One thing that I would add to this list for parents of adolescents is to acknowledge your “trouble threshold” grade. Many students, when asked, can probably point to a specific grade (for my parents it seemed to be around a B) anything below which triggers parent involvement… you know, the troubling kind (according to your kid). Studies have found that parents’ “trouble threshold grades” become their children’s threshold grade, and that “threshold grades” differ among families based on cultural and ethnic traditions. So while a parent must strike a balance between becoming that helicopter parent, by over-protecting and over-directing their children through school, there are plenty of good conversations to have with your child’s teacher this year and plenty of ways to be involved. You’ll note that most good conversations begin with a question. Our children’s sleep habits change almost immediately after school lets out for the summer. It doesn’t matter how much sleep they’ve gotten or when they went to bed. One or both of them can saw logs through 7:30 am – no problem. This is, of course, in stark contrast to a typical school morning when we have to drag them both out of bed about an hour and a half earlier. During the school year, I find myself missing the toddler days when they would bound out of bed at 5:45 am (and that moment at 5:46 am, when you realize you’re not going back to sleep, is hard to miss). I’m not too different from my children. To be honest, one of the reasons I left high school teaching was because I found it emotionally draining to get up early enough to be prepared, functional and verbal at 7:25 am. This was the time that the “warning bell” rang at the high school and class began. So let’s back this up: To be in my classroom at 7:25 am, I had to be at the copy machine at 6:55, at the computer making printouts at 6:45, in the parking lot at 6:30 (it was a big campus), leaving my house at about 5:30 (no later than 5:45). To be in the classroom at the ready at 7:25, I regularly set my alarm for 4:45 am, and that’s assuming I knew exactly what I would be teaching the next morning before I went to bed. Even after all that effort, it’s worth mentioning that if there’s one way to kill a love of learning in our nation’s adolescents, it’s talking to them about Jacksonian Democracy at 7:30 am on a Monday in February. Relatedly, if there’s one way to kill a love of teaching in an adult, it’s asking them to ignite in their students a love of learning at this obscenely early hour. In any effort to reform our nation’s schools – even something as simple as start times – we need to first uncover why it it is the way it is. Many folks know that the academic year was initially built around a farming schedule and leaves a wide berth during the long summer months for children to help their parents on the farm. I know how much you all rely on your children to bring in the harvest, so I’ll leave that one alone for now. Anyway, none of that history really explains the typical start time for a school day, and that’s because early start times are a relatively recent phenomenon. Most studies attribute early start times to the increasing role that extra-curricular activities (e.g. sports and clubs) play in the lives of the American adolescent. Add to that the need to coordinate game schedules with other districts, busing schedules for all of the district’s children, complex teaching schedules that often have multiple teachers sharing expensive resources, and managing specialists’ schedules (i.e. art, music, phys ed. ), and it becomes pretty clear why the easiest solution seems to be to start the school day earlier. One look at a building principal’s “master schedule” might elicit some sympathy in even the staunchest opponents of early start times. Despite the rationale behind the shift in school start times, there is overwhelming medical consensus about what it does to adolescents. Research has demonstrated time and time again how backward these start times are, and the toll it takes on adolescents’ physical safety, emotional well-being, and academic success. Either way you slice it, it is as unappealing to me as it probably is to you. It’s not simply a matter of interrupting adolescent sleep cycles. One study found that sleep deprivation from early start times played a role in growing obesity rates and risk behavior in adolescents. This makes plenty of good sense to me, since I regularly see the link between exhaustion and risk behaviors in my own child. The clearest indication that our five-year-old is overtired is the rapid increase in her total defiance of our basic and most commonplace rules. Early start times aren’t just inconvenient or annoying or impossible to get your body used to (owing, again, to the fact these are physiologically appropriate cycles). Early start times increase daytime sleepiness, depression and caffeine use in adolescents. At the end of the day adolescents are children – just older – and children + caffeine = negative health consequences. Let us try to forget for a moment that later start times result in adolescents who are better rested, less moody and depressed, less stimulant-addicted and less likely to crash their cars. Let’s just push that aside and consider this: Later start times have the impact that decades of school reform have struggled to produce – they actually improve student academic achievement. I think what I am saying here is that it’s a little easier for an adolescent to understand Jacksonian Democracy at 10:30 am than it is at 7:30 am. Most of this has to do with the very simple idea that it’s much easier to learn when you’re conscious. Another very simple thing is that kids who are well rested register fewer absences during the school year, and they even come to school on time. It doesn’t boggle the mind to understand how both of those behaviors lead to significant increases in academic performance. It’s not rocket science (though it is neuroscience). Let’s also acknowledge the fact that younger children require less prep-time to get ready for school. There is very little social stigma for a child under a certain age – I imagine the cut off to be about eight – to literally roll out of bed, eat breakfast and go to school. Beyond that age, the time it takes to get ready in the morning grows longer and longer. We should be delaying start times for adolescents just to give them en0ugh time to perfect their emo makeup and manage their Bieber swoosh. So, why not just reverse the schedules so younger children are headed to school first and older children catch the bus after them? Some would voice concern here over their five year old standing in the dark at the bus stop. I would be among them, because we can’t settle for a model that endangers younger children. But let’s be clear, if we can create a whole system of time zones so people on trains can remain diurnal, and if nearly our whole nation can change their clocks in unison twice a year, surely we don’t need to have our adolescents bearing the brunt in this totally wrong model. We are pretty smart people, there has to be a way to adjust that master schedule. Aside from reversing the busing schedule and school start times between elementary and high schools, we might also consider a full-switch to athletic training in the morning. I would prefer to run two miles in the morning in September versus the mid-afternoon (the hottest hours of the day). These are only a few ideas. An organization called StartSchoolLater.net chronicles the success stories that many districts have experienced in establishing later school start times, and every effort takes a slightly different angle to achieve success. You’d be surprised how many districts have explicitly adjusted their schedules in response to the overwhelming empirical evidence about adolescent sleep deprivation. Parents can be pretty powerful in this regard if we stop aiming our outrage and exhaustion toward our parenting partners and start directing it in a focused way toward the people who can impact some real change. This would be an appropriate initiative for a well-organized PTA/PTG to appeal to local school boards. Figure out what it would take. While you’re fighting the fight, just keep in mind the people that have to deal with that crazy master schedule. They’re not ignoring research out of malice, they’re dealing with the tough reality of managing multiple and often conflicting schedules. We’re all maniacs during the school year, and a special kind of maniac in the morning. This change is long overdue and research has shown it is worth the effort.